Zooku Review 2019: Is Zooku a Good Hosting? Romanian host Zooku has been providing hosting since 2001. Its shared hosting plans have a 99.9% uptime guarantee, and it also offers CMS-specific plans for WordPress, Joomla, and osCommerce. Zooku has been providing Romanian hosting since 2001. More than 25,000 domains have been registered to Zooku, and its own website is available in Romanian and English. 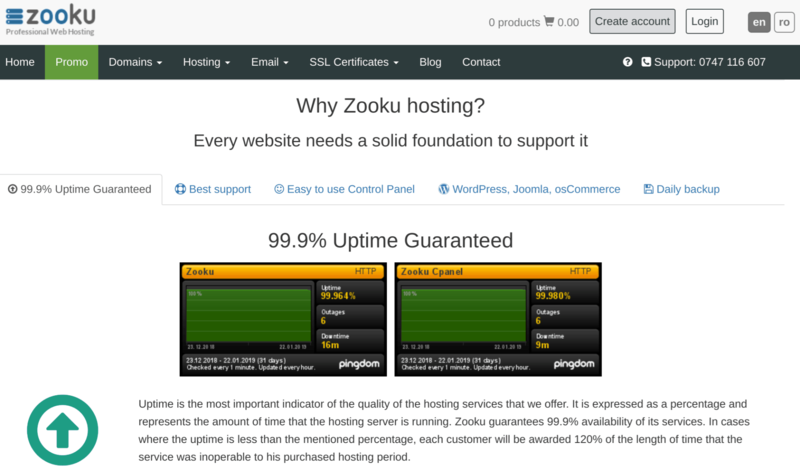 Zooku offers a solid SLA-backed 99.9% uptime guarantee. Its geographically distributed, redundant servers have 100% availability and are colocated in three Romanian data centers that have air conditioning, fire systems, and autonomous power generators. All shared hosting plans support PHP (versions 4 through 7), MySQL, and phpMyAdmin. You also get SSH access and multiple FTP accounts and can schedule Cron jobs. All plans come with DDoS protection and a free SSL certificate. Beginners will be disappointed to see that the shared hosting plans do not come with a website building tool. But there are specialist WordPress plans, and all plans come with a one-click installer for Joomla and osCommerce. There’s an easy-to-use, modern-looking control panel that can be used to manage your email accounts, databases, FTP accounts, Cron jobs, websites, and more. Having seen my fair share of control panels, I can tell you that this is one of the better-looking ones I’ve seen. Zooku’s plans are slightly pricey for the resources and features on offer, and domains cost extra. On the other hand, SSL certificates are included, and traffic is always unlimited (but most likely subject to “fair usage”). You get a good 1 GB of disk space with the lowest-price ‘Minimal’ plan, which might be enough for many of you. The minimum term for hosting plans is six months, increasing to three years for the maximum term. If that seems like a big commitment, there is a 30-day free trial that allows you to “test drive” the services. This free trial comes with ample resources including unlimited traffic, 9 GB of disk space, and technical support, so you can really get a feel for what you’ll get when you sign up. It’s unclear how many domains are included with each package, and my attempt to establish this by contacting support seemed to fall on deaf ears. I received no response after waiting for four business days. Notwithstanding what I just said, you can contact support phone or email, and the Zooku website also offers live chat (although it was offline when I visited during regular business hours). Zooku has a wide range of hosting services with some unique add-ons such as a free email marketing plan. The higher-tier plans are overpriced and lacking in beginner-friendly features, but the cheap base plan has more than enough resources for most everyday users. Wondering how Zooku stacks up against other Web Hosting companies? Enter any other Web Hosting company and we will give you a side-by-side comparison.